The analogue weather station will not only please the user with the weather data but also with an attractive design. There are not only accurate measuring instruments used for this weather station but also only the best materials. Analogue weather station for the interior (barometer, thermometer, hygrometer) made of matt glass. 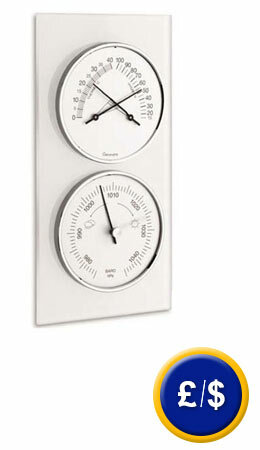 A weather station in modern design with 2 easily readable, round displays. On change of the air pressure a reliable forecast regarding weather conditions can be given. This will also be shown via 3 symbols on the barometer. Please note that this weather station can only be used in the interior. This device can be used in dry places like a winter garden, covered terrace or greenhouse. If you have any questions about these products, please call: UK customers +44(0) 23 809 870 30 / US customers +1-410-387-7703. An overview of all weather stations can be found here: weather stations. Our technicians and engineers will gladly give you advice on this Analog Weather Station and all other products in the field of measuring instruments, regulation and control and scales.